With one foot in the groove, a solo album from Peter, dedicated to the floor singers. Collection of Traditional, Contemporary, plus a couple of songs written by Peter. 12 songs Released March 2006. Track list includes, Long Dog, Long Road Home, Conversation Book, Henry the Poacher, Country Life, Angelina, Black Clothes, Eagle and Child, Cousin Jack, The Tinker Mans Daughter, Man Like Thee, Sinatra and I.
Compilation album with 4 bonus tracks recorded 'live'. Released May 2002. Track list includes most popular requested songs from previous albums plus 4 songs never recorded before. Track list: Power of Love and Life, Sinatra and I, Cheshire May Song, Black Dog of Waverton, Port of Dreams, The Ship Keeper, Man Like Thee, Beeswing, Racing Clippers, Brylcream Boy, The Convalescent, What’s the Use of Wings, Judy Hunt the Dudley Witch, My Mate, The Tinker mans Daughter, Far side Bank of Jordan, Life 'O' Sea Faring. 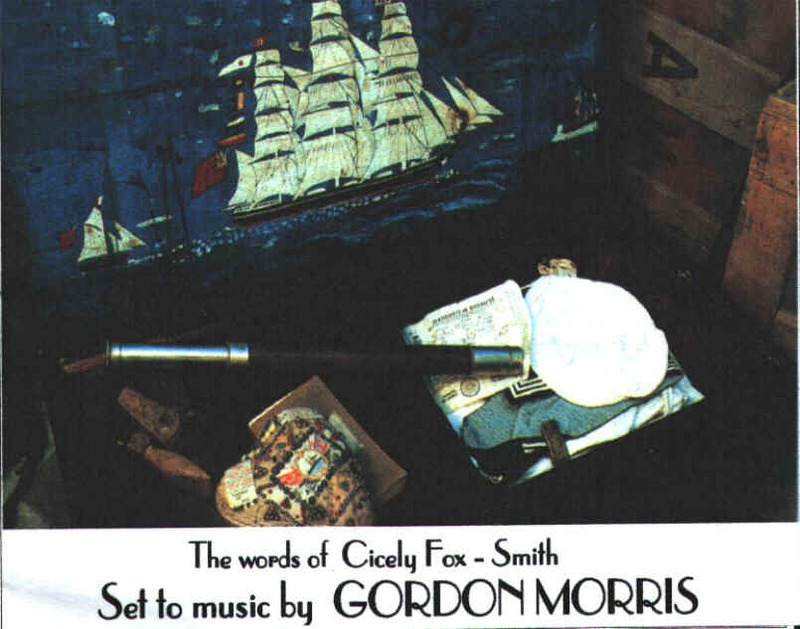 The words of Cicely Fox Smith set to music by Gordon Morris. Released June 2002. Concept album, some of the works by poet Cicely Fox Smith. Arranged and set to music by Gordon Morris. Track List: Port of Dreams, Racing Clippers, Mainsail Haul, The Convalescent, Tom Pascoe (Told at the Pilchards), Sea Change, The Extra Hand, Admiral Dugout, Stately Blackballer, Maraquita, The Ship Keeper, See you in Liverpool. Released October 1999. 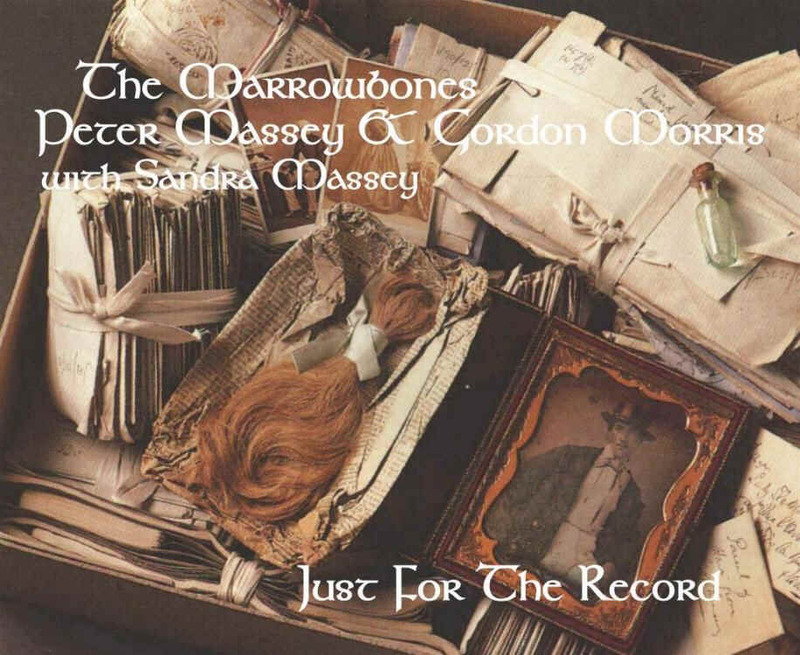 Peter and Gordon are joined on this album by Sandra, who completes the Marrowbones line up occasionally. The album has a mixture of mainly traditional songs plus six more original songs written by Peter Massey and Gordon Morris. The Track list includes...The Brylcream Boy, Judy Hunt the Dudley Witch, The Fight of The Fiddlers, Port 'O' Dreams, Joby Greyling Bowman of Cheshire, Life ' O ' Seafarin, Brother Foxes, The Ghost Story, The Trees They Do Grow High, One Misty Moisty Morning, The Spotted Cow, Babes in The Wood, What’s The Use of Wings. 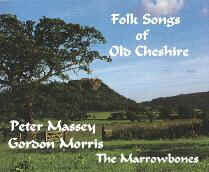 The track list includes Gods Providence House, Crane Wharf, The 24th May, Plough Monday Song, Power of Love and Life, The Peppergate Song, Sportsmen of Chester, The Headless Woman of Tarvin, Joby Greyling Bowman of Cheshire, The Black Dog of Waverton, The Fight of the Fiddlers, Rope Dance, Cheshire May Song, Oak & Ash & Thorn. All these album are available by mail order £5.00 + (P&P £2) each. All The Marrowbones albums have a full money back guarantee if you are not completely satisfied with your purchase. The album must be returned within 10 days by registered mail. The refund does not include any post and packing for returns. The Marrowbones support the BRITISH HEART FOUNDATION. Some albums are available as a Dowload from the WOVEN WHEAT WHISPERS website. Listen to some sample tracks before you buy. 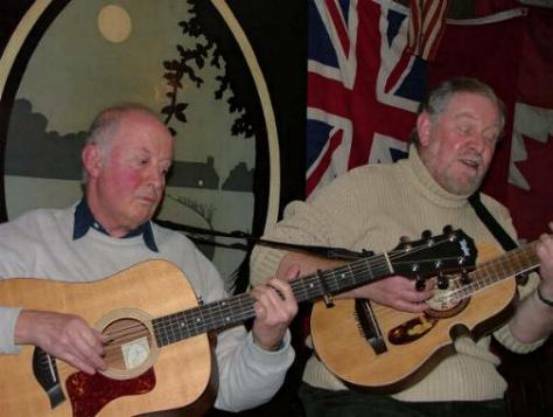 Peter Massey and Gordon Morris have been playing Traditional folk songs for over 37years. They perform mainly in the North West of England, both of them being natives of the City of Chester, Cheshire. Their musical history began in the early sixties when they formed a rock band called the 'Legends'. They won their 'spurs' playing alongside other Merseybeat groups in the dance hall's and clubs like the Cavern in and around Liverpool & Chester. It was eventually in 1962 when they went to see the Spinners in concert, that they became hooked on traditional folk music and soon started to introduce folk songs in to their program as 'electric folk'.… On discovering the new folk club scene, they soon swapped their electric guitars for acoustic instruments and along with Peter's wife Sandra, and Gordon's younger brother Graham, 'The Marrowbones' folk group was born. It was about this time that they started to write their own songs. The first one being an adaptation of an old broadside about Joseph Baker a famous runner from Cheshire. Two years later when Gordon's work forced him to live in other parts of the country the Marrowbones where disbanded. Leaving just Peter and Sandra. They continued singing in local folk clubs and were heard several times on the B.B.C. radio. Gordon in the meantime after running a folk club in the Leicester area, moved up to Scotland to live. He performed in a group called Dobbies Loan in and around Edinburgh and Glasgow. Nearly twenty years later after Gordon returned to live in the Chester area the duo was re-formed. And the song writing continued. 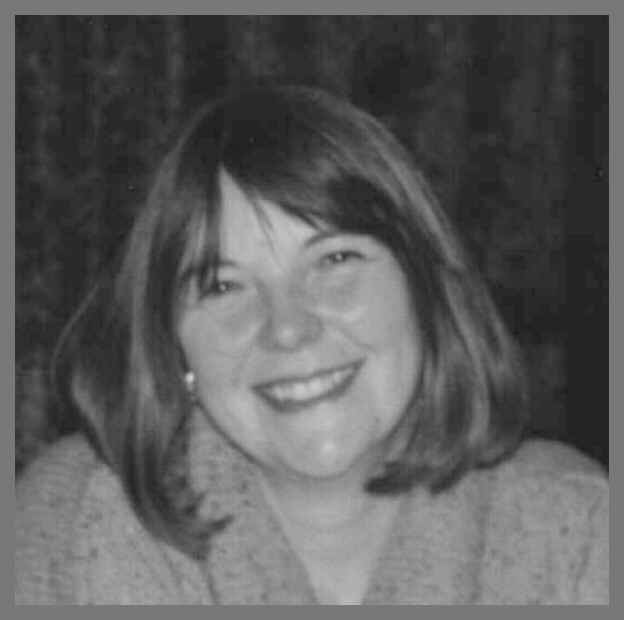 When time permits, Sandra Massey, Peter’s wife, occasionally joins them on gigs and concerts. They have developed there own, and very distinctive style of singing and playing, which is well worth listening to. Together they have now written over thirty songs.. Most of their songs although contemporary, are written in a traditional style. Some are based on old folk legends and tales from the Chester, but others explore many other avenues of folk music, including a new collection of sea songs. Nearly all the albums are recorded 'live' wherever possible. This because they believe this how folk music should sound, instead of a studio produced recording using guest musicians etc. Peter & Gordon play all the instruments and sing at the same time. Peter Massey plays Guitar, Electric Bass, and vocals. Gordon Morris plays Mandolin, Mandola, Bouzouki, and vocals. Gordon researching for his Cicely Fox-Smith songs? Wacking it out at Bromborough on the Wirral. Gordon Morris & Peter Massey. .....................Sandra Massey. 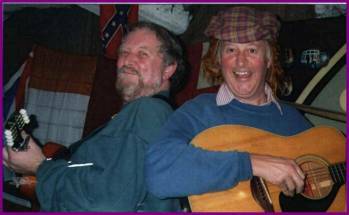 Gordon & Pete fooling around at Frodsham Folk Club. Will they ever be serious? Gordon Morris - says real musicians have day jobs! 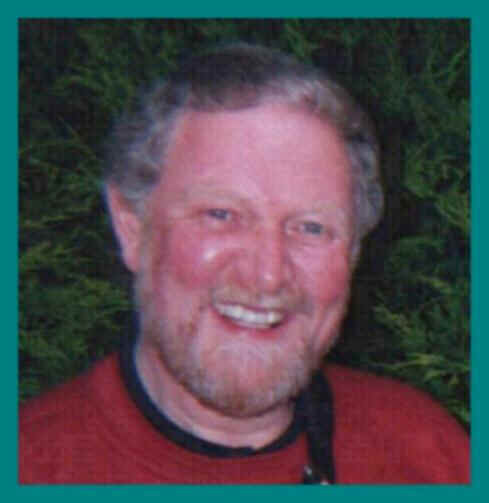 Gordon works by day for a leading security company, but secretly always wanted to put 'Folk Singer' as his occupation on his passport! Both Peter and Gordon are now Grandfathers, and enjoying every minute of it! Being the more academic of the Marrowbones, Gordon spends a lot of his spare time scouring libraries for old broadside and books of folk songs. Information on how to get your FREE Marrowbones CD. 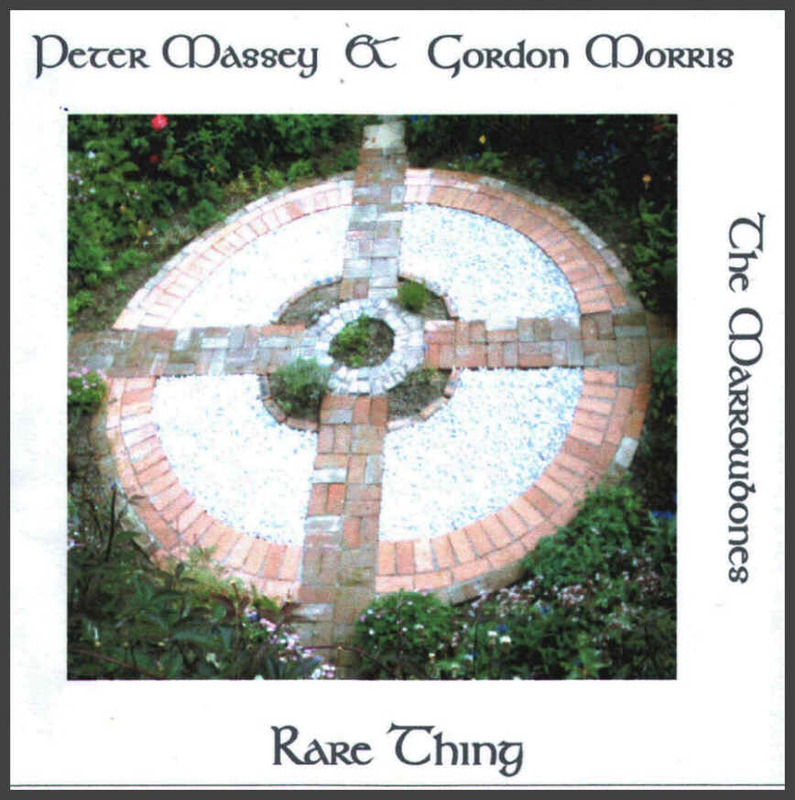 Peter Massey & Gordon Morris CD * A Taste of the Marrowbones * has 12 tracks and is yours absolutely FREE! 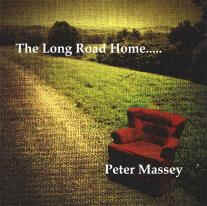 Or a copy of * The Long Road Home * - FREE! Play list includes; Long Dog, Long Road Home, Conversation Book, Henry the Poacher, Country Life, Angelina, Black Clothes, Eagle and Child, Cousin Jack, The Tinker Mans Daughter, Man Like Thee, Sinatra and I. However if when you receive a CD, and if you think it is good enough to pay something for it, then if you wish to, you can. All the profits from these CD’s will go to the charity BRITSH HEART FOUNDATION. It does not matter exactly how much you want to pay for it, - any amount you like, it's up to you. Remember there’re Free. If you don’t like it - you don't have to pay! Please note: The FREE CD’s are not supplied with a jewel case; it comes to you in a simple plastic envelope. There isn't a cover, just a simple play list and details. It is produced on CDR format. To obtain your copy all you have to do is email Peter at : The.Massey@talktalk.net with your name and full postal address, and we will put you on the mailing list. The Mersey Beat website. http://www.triumphpc.com/mersey-beat/a-z/legends.shtml Learn about the early days of the Legends, (Peter & Gordon rock band - before the Beatles put Merseyside on the map. Woven Wheat Whispers: The site that is dedicated to folk music in all it forms. The only dedicated folk music download site on the web. Listen to samples then down load the album of your choice. Click on link below to see what artists on offer on the site..
Last revised: April 2007 hosted by Free-online.net February 01, 2007.